Christmas dinner. . .ahhhh. 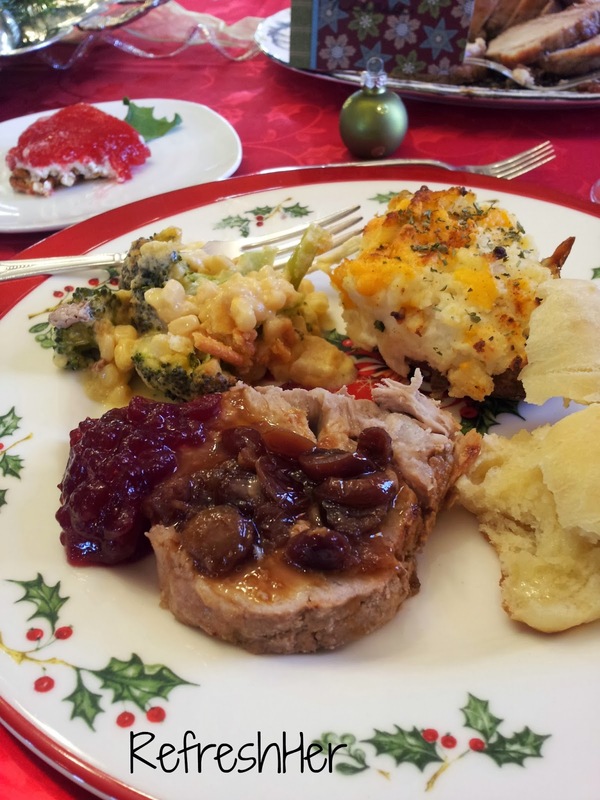 What’s not to love about those delicious holiday meals (aside from the calories!)? I broke a little away from our traditional ham dinner to Pork Roast with Cranberries. Why? I had gotten a pork roast on sale the week before, and just decided pork is pork! It was a nice change and a delicious one! Here’s my plate. . .Yeah, it was too much and I didn’t finish it! 1. Place pork roast in 3 1/2 to 4-quart slow cooker. 2. In small bowl, combine cranberries, broth, orange peel and 1/4 cup of the cranberry juice cocktail; mix well. Pour over roast. 3. Cover; cook on low setting for 7 to 9 hours. 4. To serve, place roast on serving platter; cover with foil to keep warm. Pour juices from slow cooker into medium saucepan; if necessary, skim off any fat. 5. In small bowl, combine remaining 1/4 cup cranberry juice cocktail and cornstarch; blend well. Stir into juices in saucepan. Cook and stir over medium heat until bubbly and thickened. Serve with pork roast. Garnish with shredded orange peel if desired. 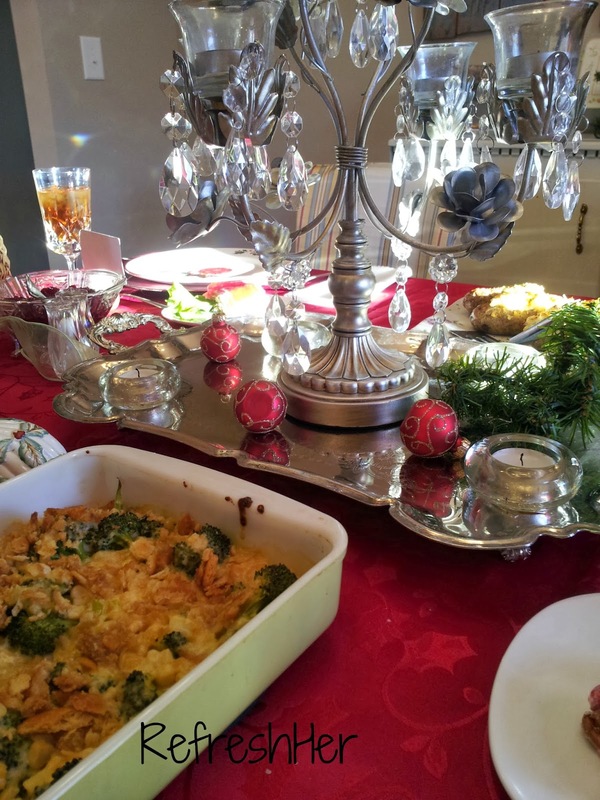 The side dish pictured above is a fabulous recipe. With corn AND broccoli in one dish, you’re doubling your time in preparing vegetables. This is creamy and yummy and has a cracker topping for crunch. Yum! This is a dish from Kraft that I got several years ago. Am I ever glad I discovered it in my recipe box before Christmas! COOK and stir onions in 1 Tbsp. butter in medium saucepan on medium heat 1 min. Blend in flour. Gradually stir in milk; cook and stir 2 to 3 min. or until thickened. Add cheese; cook 2 to 3 min. or until melted, stirring constantly. Stir in corn and 1/4 cup cracker crumbs. 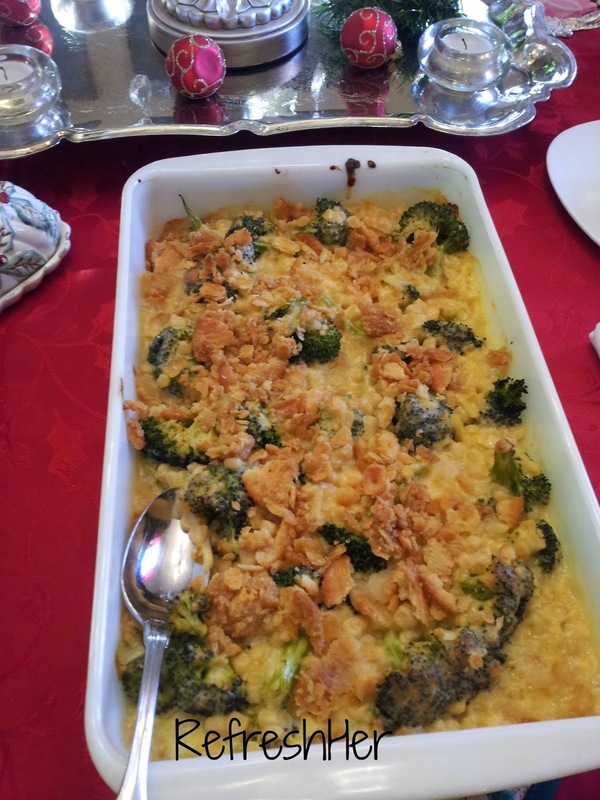 PLACE broccoli in 12×8-inch baking dish; top with sauce. Melt remaining butter; mix with remaining cracker crumbs. Sprinkle over sauce. In a small bowl, dissolve the gelatin in the boiling water, and allow to cool slightly. Add the strawberries and pineapple, and pour over the cream cheese mixture. Refrigerate until serving time. 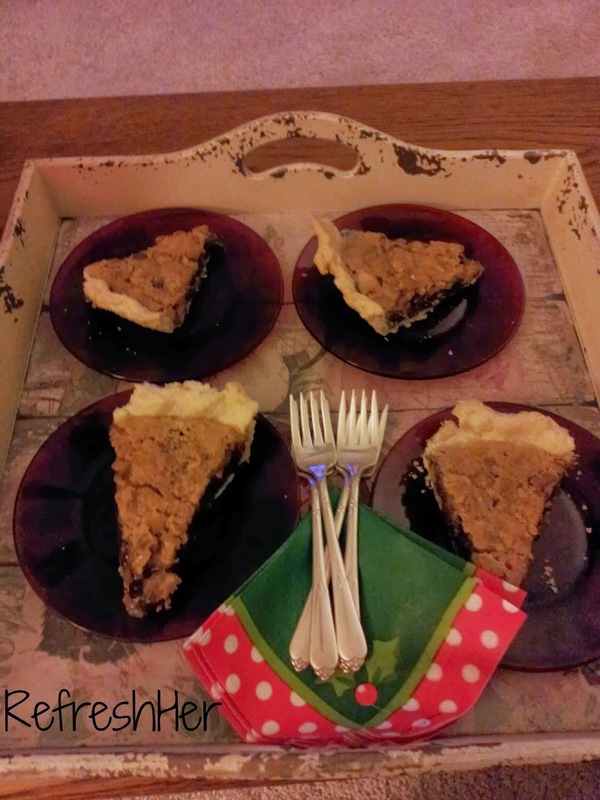 We didn’t have dessert until later that night, but it was our traditional Kentucky Derby Pie. Oh my. It’s worth the wait to only have it twice a year! I’ll share with you later this week about our great Christmas, but in the meantime, happy cooking! What special things did you cook up for Christmas? That broccoli dish looks super yummy! I think I'll be making that this week – I already have all the ingredients! 🙂 Thanks for sharing! Yum! Your place cards were so adorable, too! I can't imagine anyone not loving this dish, Jane. It's super yummy! 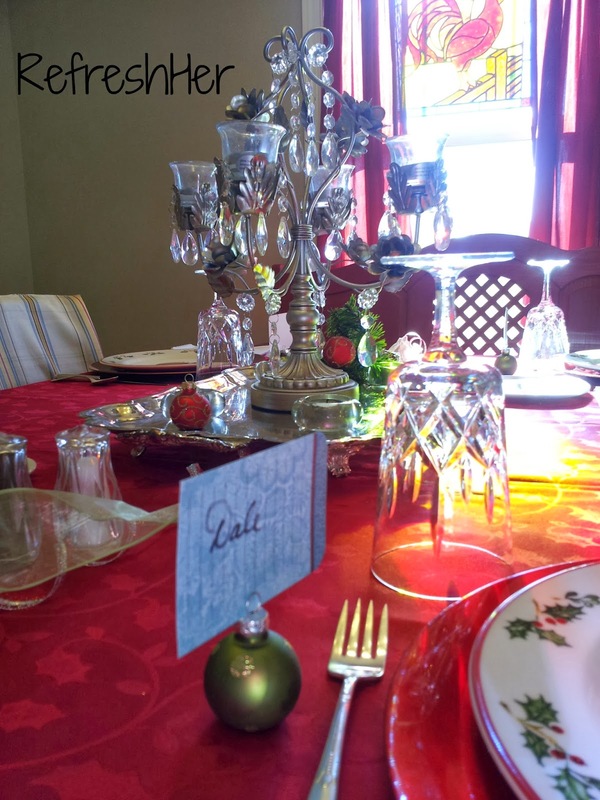 I got those place card holders at Michaels, after Christmas a couple years ago Whitney. I love them!